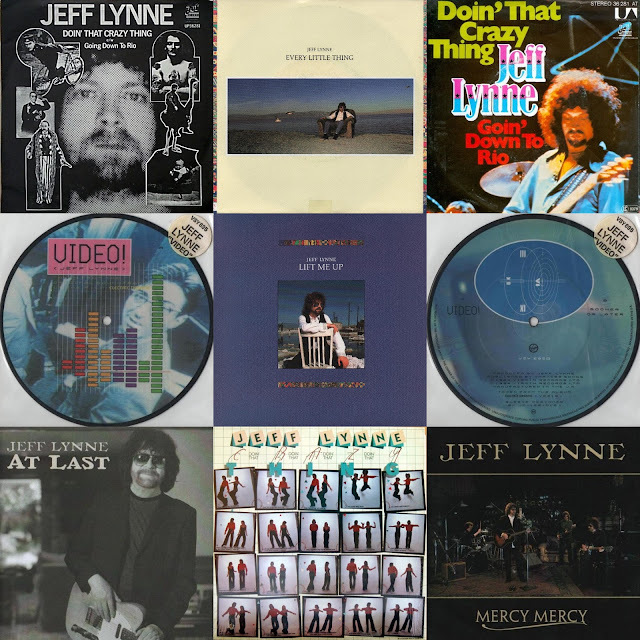 Jeff Lynne is, of course, best known for his association with the Electric Light Orchestra (ELO) and also (of course) The Idle Race, The Move and The Traveling Wilburys. The ELO maestro is also lauded widely for his production work with the likes of The Beatles, Roy Orbison, George Harrison, Tom Petty, Paul McCartney, Joe Walsh, Ringo Starr, Brian Wilson, Del Shannon and not a few other music icons. Yet perhaps the most perplexing aspect of his stellar songwriting and chart career is the more modest success of his solo releases, particularly his singles. Having charted regularly with The Move, ELO and The Traveling Wilburys, the Shard Ender is yet to register a Top 40 single in the UK having issued four physical and two download singles to date. His first solo release "Doin' That Crazy Thing" in 1977 followed the trio of Top 10 singles for ELO from their "A New World Record" album and was a major departure from his trademark orchestrated production, being essentially a disco/funk song, and promptly failed to chart. It would be another seven years until another Jeff Lynne solo single would be released. "Video!" (replete with elements of "Beatles Forever") was taken from the "Electric Dreams" soundtrack album and was a much more pacy, electronic creation that bubbled under the UK Top 75, peaking at #87. Another six years elapsed until a duo of singles were taken from Jeff's debut solo album "Armchair Theatre" in 1990. "Lift Me Up" (surprisingly) also failed to trouble the chart with "Every Little Thing" managing #59, ironically just one place higher than the Electric Light Orchestra Part Two single "Honest Men" just a year later. It was at this time - before his mainstream resurgence with Jeff Lynne's ELO - that one could say that an ELO without Jeff Lynne and Jeff Lynne without ELO were nowhere near as commercial a proposition in terms of chart performance. Happily, that has not been the case since 2012. Which brings Yours Truly KJS to the twin digital download tracks "At Last" and "Mercy Mercy" taken from Jeff's second solo effort "Long Wave". Primarily for radio and promotional purposes, two 1-track promo CD singles were issued by Frontiers and remain highly prized collectors items to this day. So there you have it. The man who wrote, sang and produced twenty seven (27) Top 40 UK singles for ELO between 1971 and 1986 is yet to have a hit solo single of his own. It's an astounding fact. This writer is of the opinion that the man behind the darkened shades will always be remembered by most fans as the man behind our beloved ELO and his work with so many other groups and musicians more than as a bona fide solo artiste. The name Jeff Lynne's ELO really does say it all. Labels: Armchair Theatre, At Last, Doin' That Crazy Thing, Electric Dreams, Electric Light Orchestra, ELO, elobeatlesforever, elobf, Every Little Thing, Jeff Lynne, Lift Me Up, Long Wave, Mercy Mercy, Video! The man is a musical genius. Great article.....wasn't aware of "Doin' That Crazy Thing"